Q. As an introduction, what would you like to tell us about yourself and your books? I never considered becoming a writer when I was young, though I loved books and reading even before I went to school. I don’t recall what my early ambitions were (I imagine being some kind of adventurer featured heavily, e.g., space explorer, fighter pilot). I’d always been fascinated by science, however, and by the age of 13 I’d decided I wanted to become a scientist. My first interest in being a writer came when I was at uni studying geology and chemistry, though I haven’t kept anything I wrote from those days; it was a load of old rubbish. I was also reading a lot of SF and fantasy then and, while doing my doctoral research (30+ years ago), I began to amuse myself by making door-sized maps of a great fantasy world, developing thousands of years of history, societies, ecosystems, etc, as one does, and writing disconnected scenes based on the history and characters I’d sketched out. It was around that time that I decided I wanted to become a writer. But what with little children, renovating one of the most decrepit Victorian houses in inner Sydney, and setting up my consulting business doing marine pollution studies, there was no time in the next decade. In 1987 the creative urge became overpowering, and I began A Shadow on the Glass, the first book of my Three Worlds epic fantasy series, http://www.ian-irvine.com/threeworlds.html, which has since grown to 11 books and more than 7,000 pages. And more books to come. A Shadow on the Glass was first published in 1998, with the remaining books of The View from the Mirror quartet following at 6-month intervals. The quartet became rather successful, both in Australia and internationally, and still reprints regularly both here and in the UK. I’ve now written 27 books in a variety of genres, including a trilogy of thrillers set in our world during catastrophic climate change (Human Rites, http://www.ian-irvine.com/humanrites.html), plus 12 books for YA readers and children. I’m having the time of my life writing, and never plan to stop. Though I still do some of my consulting work, too. In fact I’ll be wading through a sand-fly infested mangrove swamp next week, collecting pollution samples. It adds to the variety of life and writerly inspiration. Q. The Calamitous Queen is the fourth book in the Grim and Grimmer series. Do you prefer writing a single, stand-alone book or a series of books about the same characters? I’ve never written a stand-alone book. All my books are part of trilogies or quartets. I guess I’m a long-winded kind of guy. Although it’s also true that I mostly write fantasy, and fantasy readers prefer long books that are a part of a series – I know this because of the overall state of the market and also because it’s what my readers keep telling me. In fact I’ve just asked the question on my Facebook author site; you can see the responses here, http://www.facebook.com/ianirvine.author. I am considering writing some stand-alone books in future, though, partly for variety, and partly because writing such long series represents an enormous commitment of time and creativity. I love doing series, but it would also be nice to have a break and just work on a project that has a definite beginning and ending. Q. What inspired the Grim and Grimmer series? And how did you develop this series? It wasn’t inspired by any particular idea or character, but rather by the urge to write more stories for a particular age group. I particularly enjoyed writing my little Sorcerer’s Tower books, http://www.ian-irvine.com/sorcererstower.html, and librarians have frequently said that these books, which are only 10,000 words each, are ideal for reluctant readers in mid-primary schools because the books have driving plots and strong heroes and heroines. One librarian said that reluctant readers often end up with what they regard as ‘books for dummies’ and the kids would sooner read nothing than be seen reading such books. I wanted to write more books for these readers, though for slightly older ones, say 9-14. I wanted the books to have clearly drawn, extravagant characters and powerful, exciting plots. I also wanted them to be funny, because I’d never written humour before and wanted to have a go at it. And also because, while there are lots of fantasy novels for this age group, and lots of humorous novels, not many books successfully combine both. I developed the series by creating a character, Ike, who was different to other characters I’ve written about because at the beginning he’s a failure at almost everything. Useless Ike. I wanted to show how a failure can become a hero. 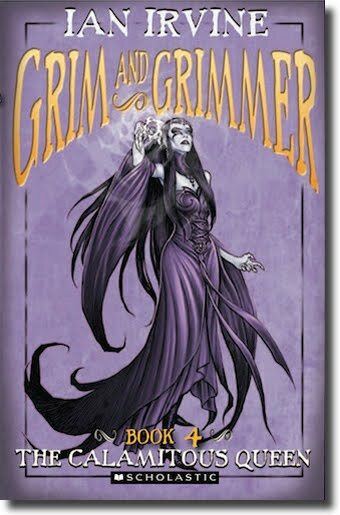 Then the series title, Grim and Grimmer (my all-time favourite title; it took many, many hours to come up with it), and the descriptive titles of the books – The Grasping Goblin, The Desperate Dwarf etc. Then I plotted out the first book, The Headless Highwayman, constantly analysing the plot events and the characters, and rewriting so as to overturn clichés and change the familiar into the unusual. That was the extent of my planning. I didn’t plot the remaining three books at all until I was ready to write each of them, though I always had in my head how the story would end. Even so, when I was writing the final book, The Calamitous Queen late last year, the ending did surprise me (favourably). Every one of the many characters gets their just desserts (in good ways or bad, and nearly always humorously). Poor Ike, though. I still shudder at his humiliation with the troll-bum door, just at the moment that’s supposed to be his greatest triumph. Q. How does writing a series differ from writing a single, stand-alone book? But it’s also pleasant to come back to familiar and much-loved characters, and to take them in new directions, or even overturn their lives and everything they stand for. Q. Is selling a series to a publisher different from selling a single, stand-alone book? In what ways? It can be easier, or it can be harder. For instance with my first series, The View from the Mirror. I sent this to Penguin in 1996, and it was read and favourably received by several people, including a free-lance editor who had been a former publisher at Penguin. Kay recommended that Penguin buy the series, though she was not confident that they would, because they would have to buy four long books and at the time Penguin had not published fantasy for the adult market. If the first book failed, the others must fail as well, which would be costly. But Penguin did buy the series and it went very well for them. On the other hand, because most fantasy readers are looking for series, it can be easier to sell a strong series than a good single work. Q. What advice would you give to writers who wish to write and sell a series? 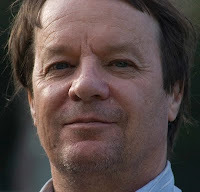 The advice is generally the same as for writers who write single books: create an engaging, clearly drawn protagonist who wants something desperately; an equally engaging and well drawn antagonist (this doesn’t have to be a person, it can be a force of nature, society or group) who wants to stop the protagonist at all costs; show their struggle in a series of conflicts and reversals; and write a powerful resolution which also shows how the protagonist has changed at the end. Create empathy for the protagonist by showing his or her emotions, feelings, hopes, fears and conflicts in every scene. Finally, create a unique and clearly visualised story world that’s based on the observation of small, unusual details, rather than being a clichéd version of another writer’s story world. But with a series, the story and the characters have to be big enough to last and grow and change through a series of books. Well, most characters. Despite what books on writing tell you, not all characters have to grow and change. The charm of many series characters (e.g. Stephanie Plum in the Janet Evanovitch crime novels, or James Bond, etc) is that they never change. And readers don’t want them to: they like these characters just the way they are. Once again, thank you Ian for sharing your insights in regards to writing and, in particular, in writing a series. Good luck with The Calamitous Queen, the Grim and Grimmer series, all of your other books, new ventures and, well, life in general. I wish you every success, as I do to everyone reading this blog. I wish you all every success! To read more about Ian Irvine, The Calamitous Queen, the Grim and Grimmer series and plenty of fascinating stuff, here are the details of Ian's blog tour. Enjoy! 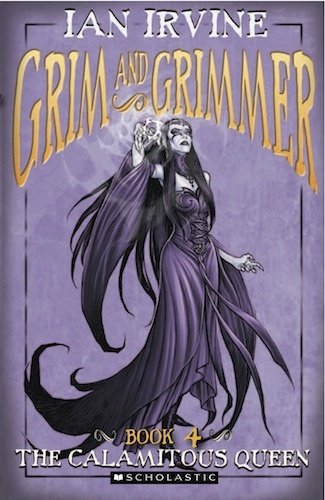 The 10 best things about writing 'Grim and Grimmer' + things that almost drove you nuts! Emajicka is marching on Grimmery with an army of a million Fey. Can things possibly get worse? Yes, they can, for Ike is all alone. Mellie has gone, attempting to pull off the perfect crime. Lord Monty is at war with his reattached head. The beautiful sprite Mothooliel wants to steal Ike’s eyeballs, and Grogire the firewyrm plans to kill him in the most disgusting way. Can Pook and Ike free the Collected children? Will Ike discover the secret of the Gate Guardians and clear his parents’ names in time to save Grimmery? Or will Spleen and Nuckl finally feast on Ike’s innards? Brace yourselves for a wild ride. "Funny and fast paced. Recommended." Bookseller and Publisher. "I gasped and laughed my way through these three books." Dee White, Kids' Book Capers. Mole Hunt - the latest novel from award-winning author Paul Collins - was released on 1 June 2011. 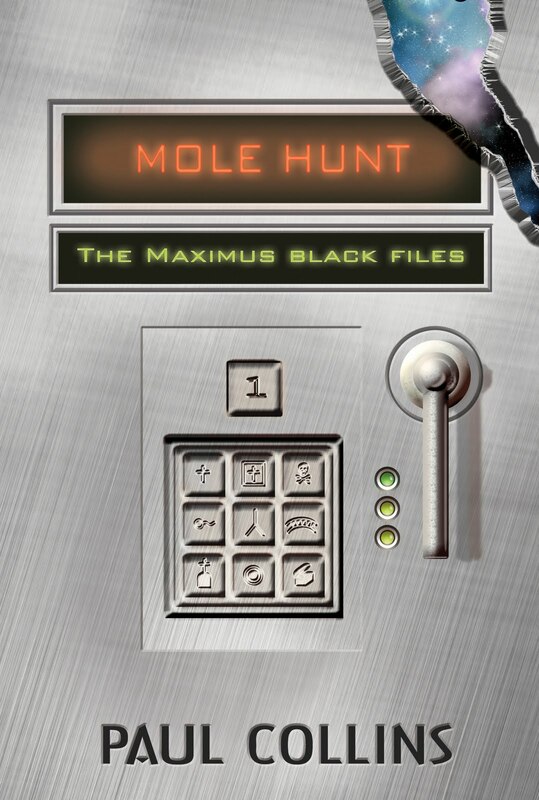 We're lucky today to have award-winning author Paul Collins here with us to answer questions about Mole Hunt, The Maximus Black Files and anything else I throw at him. Well, perhaps not "anything". Thank you Paul for visiting my blog and participating in the following interview. I know you're a busy man. Thanks for having me here, Robyn. Q: Dystopian fiction is big right now. 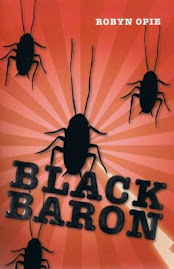 Did you write The Maximus Black Files specifically because of this genre’s popularity? A: All modesty aside, I’m usually ahead of my time. I published Australia’s first heroic fantasy novels way before the major publishers decided there was money to be made in fantasy – I only stopped because two distributors folded on me, one taking all my stock and owing me a lot of money. I actually wrote the trilogy in rough form years ago. Last year I started polishing Mole Hunt, book #1. I could see dystopian fiction was on the rise, but the publishers I’d submitted it to were keeping it for ages. I knew if I didn’t act quickly, the fad would fade and I’d have missed my opportunity. One publisher has had it now for two years! I should let them know I’m withdrawing it! I also pulled it from another publisher who had had it in their slush pile for five months. Regardless, it’s Out There now. Q: What inspired you to write dystopian fiction? A: I’ve written in this genre before. The Earthborn Wars was an SF trilogy (The Earthborn, The Skyborn and The Hiveborn) set after an apocalyptic event on Earth. Civilisation as we know it ceased to exist and roaming bands of thugs took over. Of course, although it’s bleak, there has to be some hope. In The Earthborn Wars I have Sarah, who brings together a gang of life-minded individuals and strikes out against the baddies. Maximus Black has his own nemesis in Anneke Longshadow. Q: Do you base your characters on anyone you know? A: I have done. My picture book, The Glasshouse, is based on a writer friend to whom I gave sound advice but she chose to ignore it. But it’s not often I’m driven to writing about “someone”. Anneke Longshadow is based on a character I know, and that’s Modesty Blaise. Maximus is everything I imagine an anti-hero to be: despicable, in control, conniving, darkly handsome/brooding with an unquenchable lust for violence. I could go on! Q: Apart from Peter O’Donnell, then, has anyone influenced your writing? A: I didn’t read as a kid, so I had no preconceived ideas on how I should write, conventions, etc. I did read a lot of comics. Reviewers over the years have said my fiction is fast-paced and filmic, so I imagine if anything, I’ve been influenced by Stan Lee and his team at Marvel Group Comics. I used to devour The Hulk, Spiderman, Captain America, Daredevil and a host of others. Q: Do you have a favourite genre apart from dystopian fiction? A: I’m primarily known as a science fiction writer. This is odd because I’ve written more fantasy than SF. But over the years I’ve possibly written within just about every genre, including romance (although that one didn’t sell!!!!). In a nutshell, I like fantasy. Q: Which other writers do you admire? A: When I get time I read Eoin Colfer (Artemis Fowl) and Philip Reeve (Mortal Engines). I think both write in the same vein as me, that is, filmic action. Q: Do you ever get writers’ block? If so, how do you get around it? A: I’m usually working on too many projects to get blocked. If I do, I just shift on to something else and come back to the previous project if/when I’ve resolved the problem. I find brainstorming ideas with my partner, Meredith Costain, or with friends, usually fixes any problems. Q: Now that Mole Hunt is in the shops, how do you plan to promote it? A: Social media is the best way to promote books. Facebook, Twitter, writing articles and blogs for online shops and blog sites, getting reviews in newspapers and magazines, etc. On June 10 I’ll be launching the book at Continuum. I can honestly say promoting books these days is just as time-consuming as writing the books. Q: Are you writing anything new right now? A: I suspect I’ll be promoting Mole Hunt for the next month. I’ll then reacquaint myself with Dyson’s Drop, book #2 in The Maximus Black Files. Once I’ve fixed up any glaring errors, I’ll start polishing the manuscript. Other than that, I have a fantasy novel called Broken Magic that’s looking for a home. But I suspect I’ll leave it in the bottom drawer until I have this current trilogy put to bed. Q: Last but not least, do you have a plot outline you can share with us? Special Agent Maximus Black excels at everything he attempts. The problem is, most of what he attempts is highly illegal. Recruited by the Regis Imperium Mentatis when he was just fifteen, he is the youngest cadet ever to become a RIM agent. Of course, being a certified sociopath helps. He rises quickly through the ranks, doing whatever it takes to gain promotion. This includes murdering the doctor who has certified him, as well as a RIM colonel who Black deems to be more useful dead than alive. Now seventeen, he is a valuable member of a highly secret task force whose assignment is to unearth a traitorous mole. Unfortunately for RIM he is the mole, a delightful irony that never ceases to amuse him. In the two years he has been with RIM he has only met his match once. Anneke Longshadow, another RIM agent, who nearly succeeded in exposing him. But nearly wasn’t enough. Now she is dead and he is very much alive to pursue his criminal activities. Right now, Black has a new problem; one that will challenge him to the max. He has a lot of work to do and little time to do it but as with every facet of his life, he plans each step with meticulous precision. Sadly for Black, complications arise. It seems Anneke Longshadow isn’t dead after all. Every bit his match, Anneke eludes the traps Black sets for her. Born on Normansk, a planet with 1.9 gravity, Anneke is more than capable of defending herself against Black’s hired help, the insectoid Envoy, and his professional mercenary and hitman, Kilroy. "Bitingly clever and a cross between Total Recall, Dexter and The Girl with the Dragon Tattoo.” Bookseller and Publisher. "I couldn’t put Mole Hunt down.” Kids' Book Capers. 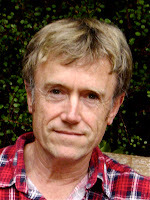 Together with Michael Pryor, Paul is the co-editor of the highly successful fantasy series, The Quentaris Chronicles; he has also contributed seven titles to the series as an author. Paul’s other works include The Jelindel Chronicles, The Earthborn Wars trilogy and The World of Grrym trilogy written in collaboration with Danny Willis. Paul has been the recipient of several awards, notably the inaugural Peter McNamara, the Aurealis, and the William Atheling. He has been short-listed for many others, including the Speech Pathology Australia and Ditmar awards. Paul has worked as a pub bouncer, served time in the commandos, has a black belt in both tae kwon do and ju jitsu, was a kickboxer, and trained with the Los Angeles Hell Drivers.